Jonathan Heaton, who became known as “The Father of Alton,” owned the land known as Oak Flats. He hired Lysander Porter to survey the land into nine ten-acre blocks, dividing each into four lots or thirty-six two-acre lots. Jonathan donated the central block for the community’s town square. The first house in town came in the winter of 1907 when James Glover moved his Sink Valley ranch house three miles up the valley to the newly established town site. The move began by placing the house on two logs used as runners chained to twenty-four of the community’s best horses. After ten days of hard labor in four feet of snow, the home came to rest on the chosen lot. Ira Heaton built the first new home in 1908. 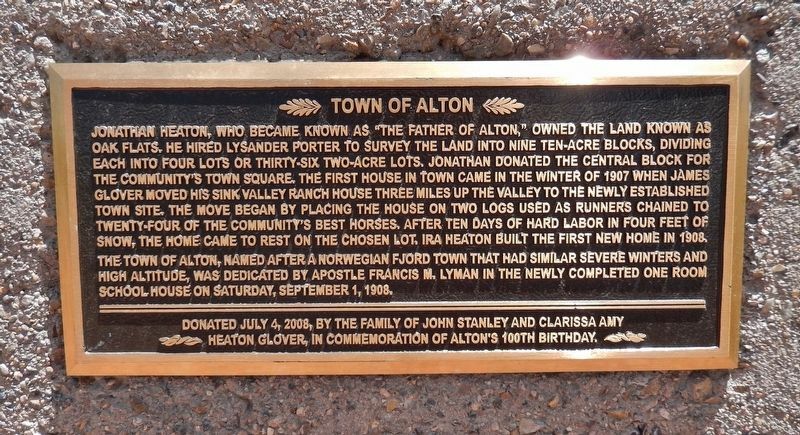 The town of Alton, named after a Norwegian fjord town that had similar severe winters and high altitude, was dedicated by Apostle Francis M. Lyman in the newly completed one room school house on Saturday, September 1, 1908. Heaton Glover, in commemoration of Alton’s 100th birthday. 2008 by The family of John Stanley and Clarissa Amy Heaton Glover. Location. 37° 26.744′ N, 112° 29.259′ W. Marker is in Alton, Utah, in Kane County. Marker is on Alton Road (County Road 10) 3.3 miles east of U.S. 89, on the right when traveling east. Touch for map. Marker is located in a pull-out on the south side of the highway, as you approach Alton from the east. Marker is in this post office area: Alton UT 84710, United States of America. Touch for directions. Other nearby markers. At least 8 other markers are within 15 miles of this marker, measured as the crow flies. United Order Woolen Mill (approx. 9.7 miles away); Asay Settlement (approx. 9.9 miles away); Glendale Orientation Center (approx. 10.6 miles away); Millstones (approx. 10.6 miles away); The Berry Family (approx. 10.7 miles away); Glendale (approx. 10.8 miles away); People of the Land (approx. 14.2 miles away); Orderville Bell (approx. 14.3 miles away). More about this marker. 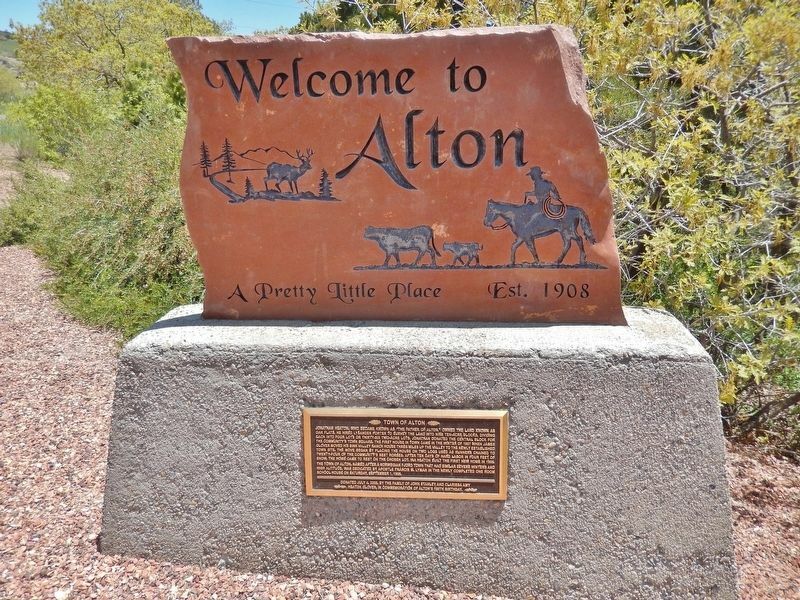 Marker is a rectangular, embossed metal tablet, mounted at ankle-level on a concrete pedestal, below the "Welcome to Alton" sign. More. Search the internet for Town of Alton. Credits. This page was last revised on March 6, 2019. This page originally submitted on March 5, 2019, by Cosmos Mariner of Cape Canaveral, Florida. This page has been viewed 42 times since then. Photos: 1, 2. submitted on March 5, 2019, by Cosmos Mariner of Cape Canaveral, Florida. • Andrew Ruppenstein was the editor who published this page.